University of Belgrade, Technical Faculty in Bor, has been publishing the journal called Journal of Mining and Metallurgy since 1965 and in 1997 it was divided in two independent journals dealing with mining and metallurgy separately. 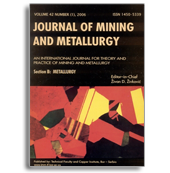 Since 2009 Journal of Mining and Metallurgy, Section B: Metallurgy has been accepted in Science Citation Index Expanded. Journal of Mining and Metallurgy, Section B: Metallurgy presents an international medium for the publication of contributions on original research which reflect the new progresses in theory and practice of metallurgy. The Journal covers the latest research in all aspects of metallurgy including hydrometallurgy, pyrometallurgy, electrometallurgy, transport phenomena, process control, solidification, mechanical working, solid state reactions, materials processing, surface treatment and relationships among processing, structure, and properties of materials. According to the SJR (SCImago Journal Rank), Journal of Mining and Metallurgy, Section B: Metallurgy was ranked as Q2 (SJR 0.451) in categories: Geotechnical Engineering and Engineering Geology, Mechanics of Materials, Materials Chemistry and Metals and Alloys for the 2017. The article in Journal of Mining and Metallurgy, Section B: Metallurgy are published under the Creative Commons Attribution-ShareAlike 4.0 International License. The authors who wish use the article in a way not covered by this license must obtain a written consent of the publisher. The JMMB is an Open Access Journal. All articles can be downloaded free of charge and used in accordance with the Creative Commons Attribution-ShareAlike 4.0 International License.